How Much of Humanity is on Your Side of World? 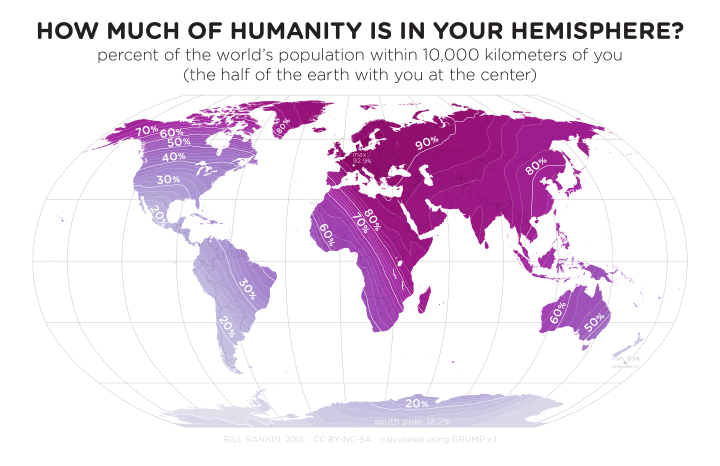 The map above, by Bill Rankin at Radical Cartography, shows what percentage of humans living on earth, live within 10,000 km of you. Or to put it a slightly different way how many people live on your half of the world (your own personal hemisphere). There are a few interesting things to note about the map. The point on the earth with the highest number of people living within 10,000km, is located in western Switzerland with up to 92.9% of all humans living on the same side of the world. Conversely, some of the islands off the coast of New Zealand have only 7.1% of the world’s population living on their side of the world, which is even lower than the South Pole at 12.2%. In the United States, the percentage of world population living in their half of the world drops as you go south and rises as you head north (just look at Alaska). This is because the Pacific Ocean is so big that it puts Asia on the other side of the world. 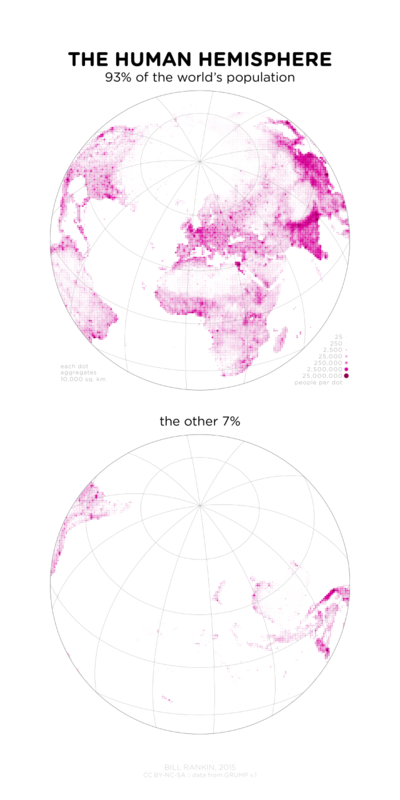 88% of humanity lives in the Northern Hemisphere. 82% lives in the Eastern Hemisphere. The maps above are very similar to the land and water hemispheres of the world. The map is not showing center of population, which is unknown globally but thought to be somewhere north of South Asia. Finally, if you’ve wondered what’s on the other side of the world from you have a look at: Antipodes World Map & Why You Can’t Dig To China From The US. I don’t understand why the center would be in Switzerland and not the center of population (north South Asia). What is the population of the hemisphere drawn from that center? Why would the center be the center of population? You can move the center of population around by moving people around in the hemisphere, but this doesn’t affect the number of people in that hemisphere. The current hemisphere is almost identical to the hemisphere maximizing the amount of land; moving the center to the east would drop out highly-populated California and Mexico in exchange for unpopulated Pacific Ocean.